I have been crazy for gnomes this past year. I blame Gen Con. Well really I blame Gut Bustin’ Games and their Oh Gnome you Don’t board game that had a heavy presence at Gen Con. It looked like a fun game and we even got a demo at their booth. Also our niece took a crochet class at Gen Con to make a gnome/wizard amigurumi. She is a knitter and new to crochet. I made a gnome from the pattern and loved it so I made more. 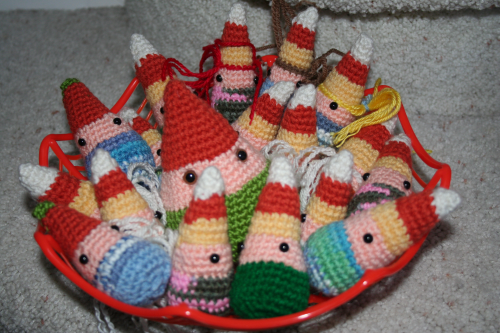 For Halloween, I made some candy corn gnomes. Their hats are candy corn colored. I also made a few pumpkin gnomes with a green and orange colored hats. I had made a bigger one with the idea of decorating with it but didn’t get around to it so I just put it in with the others. Naturally it was the first to go. I made some Halloween crochet monsters in 2013. I have some ideas for Halloween 2015 that I need to start working on. My crochet goal this year is to finish all projects early which means having Halloween crochet done by October 1st. This was a fun project and hopefully will have a reason to make more gnomes in the future.